Michael Tsavaris emigrated to Akron, Ohio with his mom and brother Bill from the island of Symi in the early 1970s. They came to find their father, who was already in America, working and trying to build a new life for his family. By the mid 1980s the brothers had built their own families and decided to buy their first restaurant and relocate to Mansfield, Ohio. That was 1985 and the they were welcomed and supported in their new venture by the local community. 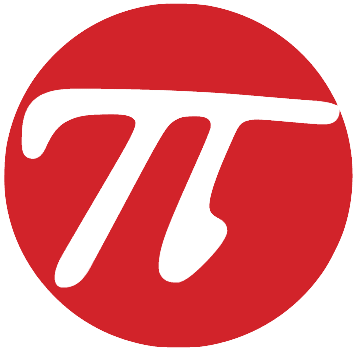 The following year Michael, his wife Susan and their two young daughters, then 5 and 7 years old, were gathered in their small apartment when he told his family that he was grateful for the support of the local community and that he wanted to open the restaurant on Christmas day and offer a free dinner to anyone who needed it. 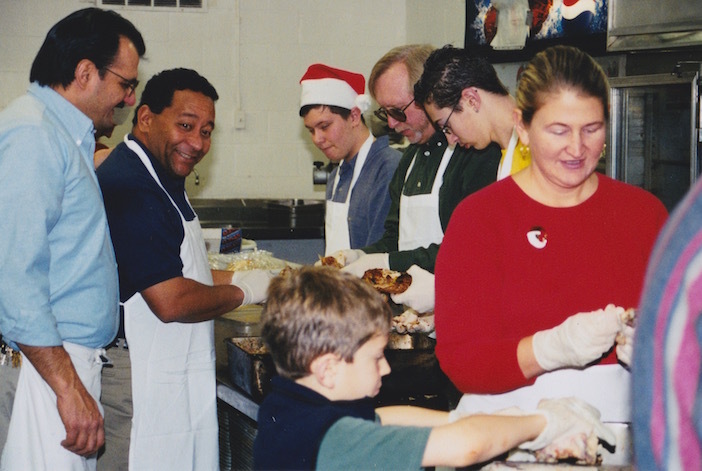 It was 1986 when Michael Tsavaris and his brother hosted their first free Christmas Dinner. This year is their 30th annual day of giving to those less fortunate and comes at a time when the region has fallen on economic hard times. It’s a family affair at the restaurant on Christmas day as the entire family comes together to prepare more than a thousand meals every year. Over the years, in addition to the dinner, Michael and his wife have expanded the dinner to include gifts for children, warm clothes and “to go” containers for people to take home to those who might not be able to leave their homes. Organizers even offer transportation to and from the restaurant for people without the means to get there. What started as a few hundred meals in 1986 has turned into a moving tradition of generosity and gratitude that dishes out more than a thousand meals every year and involves three generations of the Tsavaris family— Michael’s children and grandchildren are all involved, as are dozens of volunteers who help the family. 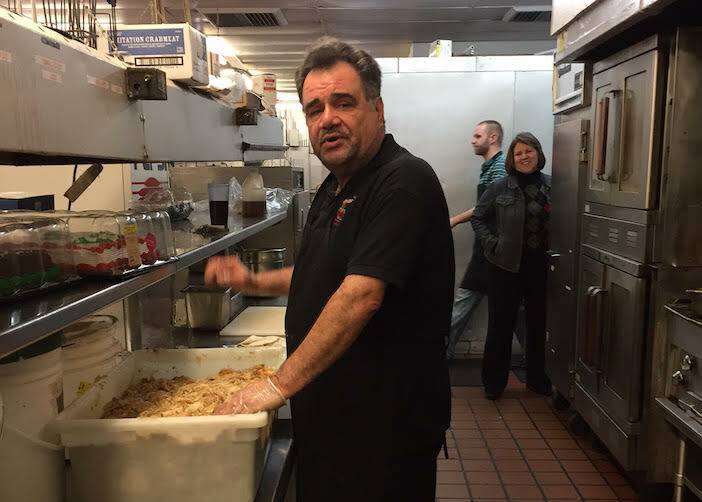 Mike Tsavaris is in the kitchen of his restaurant on Christmas Day 2016, preparing food that his restaurant will serve to anyone who walks through the door– no questions asked. Today, the tradition continues. Thirty years later and more than 30,000 meals to anyone who needs one, the Tsavaris family has gathered once again to share their Christmas with members of their community in need of a meal. For Mike and Susan Tsavaris, it’s all about love and gratitude.